We are less than 1 week away from the 7th annual #TL5K! Because we decided to move the Teen Lifeline 5K to the Spring, we did not actually have a #TL5K in the year 2015. That means that we have not held this run since October 2014, a whole year and a half ago, and a lot can change in a year and a half! It is easy to forget how far we have come in that short amount of time, but as we gear up for this year’s race, I want to take a step back and reflect on how far Teen Lifeline has come since 2014. We have held support groups in 9 different school districts throughout Tarrant and Wise Counties. And since last spring, we have been facilitating support groups in Fort Worth ISD! Teen Lifeline has held 2 volunteer facilitator trainings at the National Conference on Youth Ministries (NCYM), training 16 individuals. We hosted Leadercast for the first time in May 2015! Chris Robey wrote and developed a 10-session support group curriculum specifically for teen-aged parents. That curriculum is now being used with Birdville ISD teen parents and at our Keller Teen Parent Meetings. 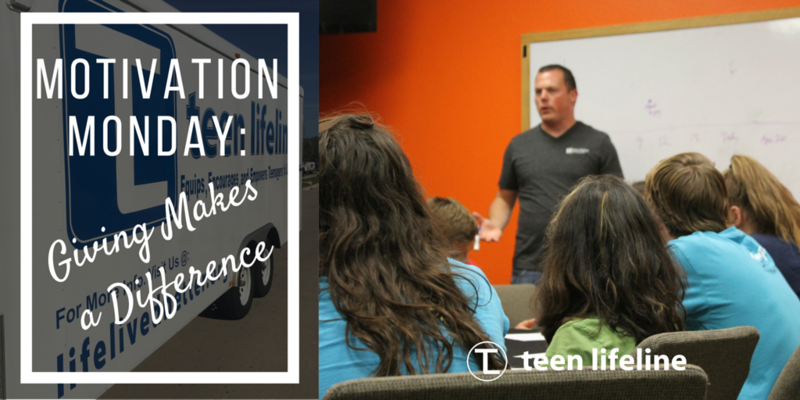 We are able to help with Teen Parent Meetings in Keller and North Richland Hills because of our new supply trailer. This trailer is fully mobile and holds essential supplies that are given to teen parents like diapers, clothes, bottles, wipes, and much more! Teen Lifeline held it’s first Dinner and Auction at Joe T. Garcia’s raising almost $30,000 in one night! We have now trained a total of 100 individuals to take our Life Lived Better Curriculum into their local school district. Teen Lifeline has started a new podcast called Stay Calm, Don’t Panic to help equip, encourage and empower those who live, work and interact with teens. In 2015, we worked with 837 teenagers through support groups – our biggest year yet! In the 2015-2016 School Year, we have already seen over 747 students. During Fall 2015, we reached 435 teenagers – more than Teen Lifeline’s first 3 semesters combined! As you can see, Teen Lifeline is growing. More teenagers are being reached. More teen parents are getting the help that they need. More youth ministers, social workers and volunteers are helping their local school with our curriculum. I say all of this not to toot our own horn – just the opposite! I am telling you about the last year and a half to thank you! None of the great goals mentioned above would have happened without the 2014 #TL5K, or End-of-Year giving, or the Dinner and Auction, or Renew Weekend. If you think that giving your time or finances doesn’t matter, I am begging you to take another look at Teen Lifeline! We are able to meet with teen moms and provide them and their babies with cute clothes and quality diapers. On a weekly basis, we get to share hope and a new perspective with teenagers who feel stuck and alone. Teenagers get to discuss stress management, relationships, school life and more on their school campus during the school day. There are countless stories I could tell you that would make you laugh, cry and might even make you want to hang out with teenagers! Hopefully you have gotten a glimpse into some of these stories over the past several months. Hopefully you see the value in your gift. We cannot thank you enough for the last year and a half! If you haven’t already given, please consider helping us reach our #TL5K goal of $70,000! Every single donation (no matter how big or small) helps teenagers and gives us the opportunity to step into the life of a teenager to equip, encourage and empower them to live life better.